I swore I wasn't going to get this set from Stampin Up but that witch boot won me over. There were just too many things to do with the dots on the boot. My first thought was googlie eyes and here it is! Posted by Karen at 7:16 PM 0 Click here to leave me a comment. 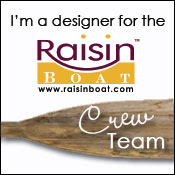 With as much as I like candy, although its off the list of what I can eat, I just had to have this set from Raisin Boat. The candy stamps included are so versatile. 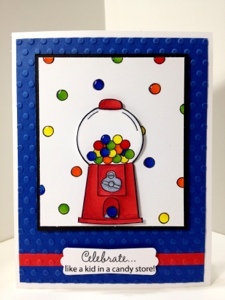 I used the spiral round to make the lollipop which matches the lollipop background stamp. 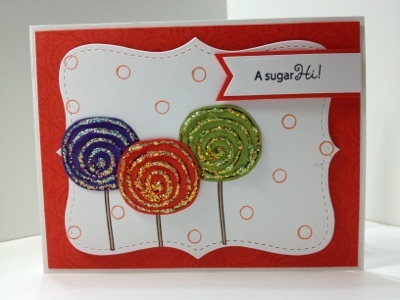 I stamped the candy sticks an added the candies on top. I added the ice ice stickles to the swirls to make them a little more delicious! Posted by Karen at 8:40 AM 0 Click here to leave me a comment. Happy Saturday everyone! 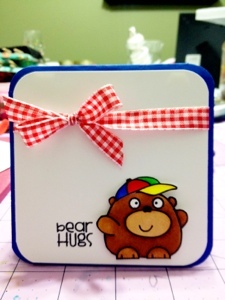 Today I'm sending out Bear Hugs to all of my wonderful followers! I colored the bear with my Copics and made a simple little pick me up card! Posted by Karen at 11:46 AM 0 Click here to leave me a comment. Happy Friday everyone. We are settling back in from our trip and getting back in the groove of our daily routine. 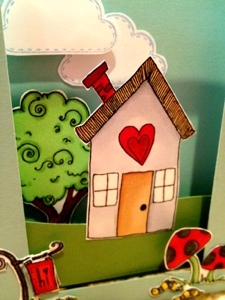 Today's care was made in bits and pieces and then I decided to put it all together in this 3D card! 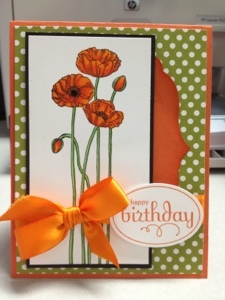 I cut the base of the card and then the opening and started creating my layers. It's not as hard as it looks. 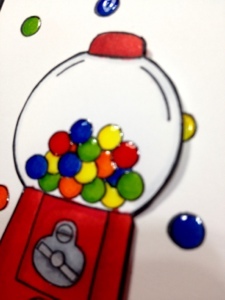 All of the images were colored with Copics then cut out and attached. So cute! I will provide a layout of the scores next week so you can make your own. Today's card is a play on words. My sister had the. 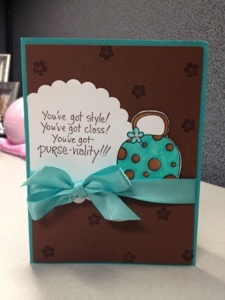 It's little purse stamp so I created the card and added the sentiment when I got home! The purse was colored with Copics and I added a little bling to the center of the flower. Posted by Karen at 8:53 AM 0 Click here to leave me a comment. It's been so nice not to have to get up and get ready for work a few days. Now it's back to the grind. My body is tired but I'm up and at em! 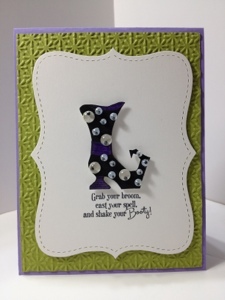 Today's card is made with my new paper smooches stamp set. I just love the saying. 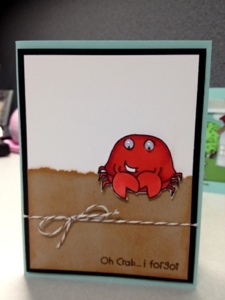 I colored with crab with my copic markers and added google eyes. I distressed the edges of the sand for a little texture! Posted by Karen at 8:31 AM 0 Click here to leave me a comment. Posted by Karen at 11:21 AM 2 Click here to leave me a comment. I hope everyone is staying cool. It's no so humid thank goodness. 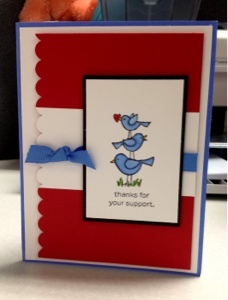 Today's card is made using the new stamp set from Stampin Up called for the birds. Lots of Copic opportunity here! I also used the spica pens for a little bling! I layered the stamped image in black and then one of the framelits from the apothecary set for the red behind the black mat. I matted the base with the yellow polka dot paper. It's just do fun and cheery! Posted by Karen at 1:18 PM 0 Click here to leave me a comment. Another Monday! Here we roll again. I just love the cheerfulness of today's card. 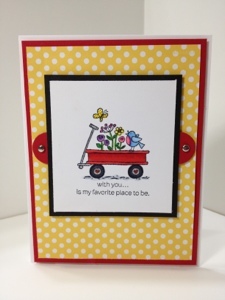 It is made with the new Pleasant Poppies stamp from Stampin Up. The sentiment is from Terrific Tags. I colored the poppies with my Copic markers and used the new polka dot paper for my background. I hope all of you are practicing your perfect bows. Practice really pays off. Continuing on with my C25K program as well as the gym three times a week. Last week I added an awesome core work out that left me in pain. It will feel so good when it stops hurting! Posted by Karen at 8:07 AM 0 Click here to leave me a comment. I hope everyone had a safe and wonderful 4th! I have missed posting the last week as a lot has been going on. I have three cards sent off for upcoming publications in magazines and am working on a few more to be sent in for consideration. I have also started the C25K program. It's not as easy as you think. I never really thought about running a 5K but as they say never say never! 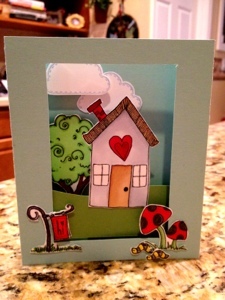 I matted the image on a scalloped edge piece of stampin up cardstock and just happened to have the perfect blue ribbon to match the card base! Stay cool this weekend. Hopefully it will be a little cooler here. I've got some training to do! Posted by Karen at 8:27 AM 0 Click here to leave me a comment.